Multi-dimensional CD that works with any conventional CD player, to which we have added a frequency of 40HZ (GAMMA) which is a natural resonance of the brain that stimulates intellectual and mental activity: creativity, problem solving, meditation, harmonization and feeling of blessing and protection. 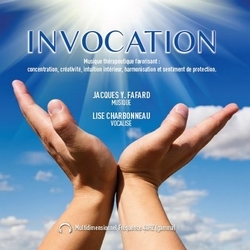 The play The Great Invocation is a musical inspiration from an ancient world prayer (mantra) transmitted through (Alice Bailey) and translated into more than 70 languages for the elevation of human consciousness and the transformation of our planet earth from this new era. Light, love and power restore the Plan on the earth. We are happy to share his listening on Radio PLENITUDE, every day, from February 15, 2019 to March 14, 2019 inclusive before it enters a regular program. 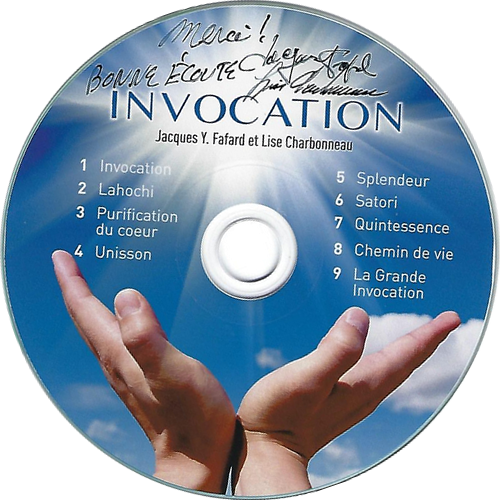 Thank you very much to Jacques Y.Fafard and Lise Charbonneau for their dedication to our attention from their CD "Invocation"
We are happy to share it with you faithful and new listeners.